Voice of Israel is a collection of Abba Eban’s speeches before the United Nations’ Security Council and General Assembly, at universities and other venues between 1948 and 1968. Eban addresses Israel’s position on security in the Middle East, the Arab refugee problem, Jerusalem and the Holy Places, freedom of navigation through the Suez Canal and the Straights of Tiran, border clashes, American-Israel relations and the Six-Day War. “For almost two generations, Abba Eban was Israel's voice — its messenger to the high and mighty among the nations as well as to the Jewish people all over the world. Since he first appeared at the side of Dr. Chaim Weizmann in the late 1940’s during the struggle for Jewish statehood and sovereignty, few people could articulate the Zionist and later the Israeli case with comparable eloquence and conviction. With his Churchillian prose and almost Shakespearean cadences, his mellifluous phrases and sonorous voice carried for decades a message of hope from a people that could have lost all hope and trust in humanity after the horrors of World War II. As Ambassador to the United States and the UN, and later as Foreign Minister, he represented an Israel with which the world's liberal imagination could identify. Larger and more powerful nations were envious of so powerful a spokesman, and his speeches became textbook models for statesmen and diplomats in distant lands. His books — which he found time to write despite the hectic demands of diplomacy — were a unique combination of enormous erudition and crystalline clarity. His scholarly training and rhetorical gifts supplemented each other in a rare fashion. Rarely has a small country been represented by a statesman of such world stature: only Thomas Masaryk and Jan Smuts come to mind to compare with him. 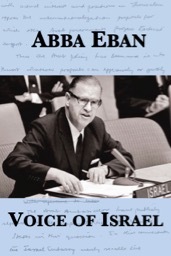 Abba Eban’s speech before the General Assembly of the United Nations on May 5, 1949 in Lake Success, New York, to support Israel’s admission to the United Nations can be heard here. This address appears as chapter 3 in Voice of Israel. Abba Eban spoke on April 12, 1958 in this Mike Wallace TV interview.